The Metropolitan Museum of Art , Benedek, Nelly Silagy, Meinhardt, Joan, Emsworth Design, Inc. 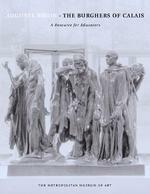 This PDF textbook from the Metropolitan Museum of Art introduces Rodin's sculpture of the Burghers of Calais. This publication includes a summary of the sculpture's history, general information about Rodin, connections with other artist's works, a detailed analysis of the sculpture's formal innovations, and a writing activity. These materials should prove useful for teachers of various disciplines. Studying and appreciating the complexities and nuances of Rodin's The Burghers of Calais will teach students about innovation, creativity, heroism, self expression, as well as about looking, thinking, and writing critically. The resource discusses the following questions: 1) Who are these men? 2) What is their relationship to one another? 3) What are they doing? 4) Why are their hands and feet so large in comparison with their bodies? 5) Why are they facing in different directions? 6) Does the sculpture tell a story? 7) Why is it an important work of art? Muybridge The photographer's images of people and animals in motion mirror the effect of the six burghers' repeated gestures. Social studies students may discuss Rodin's sculpture in terms of its subject matter. The Burghers of Calais is a tribute to six men who were prepared to die in order to liberate the French town of Calais, under siege by King Edward III of England in during the Hundred Years' War. The sculpture offers Rodin's perspective on what it means to be heroic in times of war. His heroes, however, are not examples of unqualied bravery. They are conicted individuals exhibiting a range of emotions, including doubt, despair, and confusion. > Using the language of art criticism,students will write analyses and interpretations of Rodin's work. In addition to doing the classroom activity in this resource, students may research Rodin's work and read critical reviews of his sculpture in books and periodicals. They then may discuss how critics of Rodin's time interpreted his work and compare these responses with their own. > Students will analyze and interpret the ways in which psychological concepts are explored in The Burghers of Calais. By discussing the expressions on the faces of the six burghers, students will attempt to determine which emotions and concepts are explored by the artist as well as their signicance. > Students will describe the impact of the work of art on the viewer. Students will describe the impact of Rodin's sculpture on the viewer through discussions and through the writing exercise described in this resource. Standard :Understanding the cultural dimensions and contributions of the arts > Students will explore the signicance of Rodin's piece in terms of its cultural context and will compare Rodin's work to the art of other cultures and/or eras. Students may write a short research paper comparing Rodin's The Burghers of Calais with public sculptures in their own neighborhoods that pay tribute to a hero or famous leader. The students may discuss how the artists express the idea of heroism or bravery in different ways or how the depictions of heroism are similar. Students may compare Rodin's sculpture to works by Edgar Degas Both Rodin and Degas created formsspecically torsos, limbs, and facesthat they use repeatedly throughout their work. Constructing compositions in this way creates a sense of movement throughout the piece; it also focuses attention on the rhythm of the formal arrangement rather than on a description of a particular event or person. Studentsalso may compare Rodin's work to the art of twentieth-century artists Discussions may focus on how Rodin's work was innovative in expressing psychological content as well as in experimenting with form. Students also may discuss Rodin's sculptures in relation to those produced by non-European artists, such as artists from Africa and Asia Students may focus how artists from different cultures depict the human gure. rules that were supposed to guide the artist in his work. The "pyramid" refers to a hierarchical arrangement of gures, with the most important gure on top anked by lesser ones, which the artist Jacques-Louis David (1748-1825) used in his work. Rodin saw these guidelines as limitations and perceived their implementation as formulaic and affected. Rodin was determined to create a work that delineated the importance of each of the burghers and emphasized the individual gestures, facial expressions, and postures. He refused to conform to a prescribed academic style dictated by the cole des Beaux-Arts (the ofcial school in France for training painters) and the council that had commissioned his work. Although the council had reservations about Rodin's work, they agreed to allow him to nish it. Rodin received francs on June and, although the commission was suspended that year due to a nancial crisis in Calais, Rodin continued working on the piece. He exhibited the group in plaster at the Exposition MonetRodin in Paris during the spring of In September Mayor Dewavrin reinstated the commission and Rodin proceeded to look for a foundry that would cast the sculpture according to his specications. The rm of Le Blanc-Barbdienne agreed to cast each gure in a single piece and then join them together. On June Rodin's The Burghers of Calais, on a high pedestal and enclosed by an iron fence, was unveiled in the Richelieu Garden in Calais. In the monument was moved to the front of the Calais town hall (the Htel de Ville), now without the fence and on a much lower pedestal, as Rodin originally had specied. > The hands and feet are proportionally large. The hands and feet of each gure are large and ponderous, out of proportion to the rest of the body. Rodin communicates the severity of the burghers' situation and, specically, the weight of their decision by literally weighing the men down, binding them to the ground. They are literally and guratively burdened by their collective decision to sacrice their lives. Rodin states:They are still questioning themselves to know if they have the strength to accomplish the supreme sacricetheir soul pushes them onward, but their feet refuse to walk. They drag themselves along painfully, as much because of the feebleness to which famine has reduced them as because of the terrifying nature of the sacrice. .Miller and Marotta, Rodin:The B.Gerald Cantor Collection, p.
> The burghers are dressed in plain garments rather than in ne,expensive clothing that would identify them as leading citizens of their town. All the men wear simple, nondescript garments, which look like a kind of undergarment rather than the nery that would have identied them as the leading citizens of Calais. Although Froissart's text explains that King Edward III ordered the burghers to dress in plain garments, the council conveyed to Rodin that if he had shown them at an earlier moment in the narrative, they could have been portrayed in more stately, respectable clothing. Rodin, however, chooses to show the burghers when they are leaving the city and look the most vulnerable. He wants them to appear as ordinary human beings en route to a terrible fate. > Their facial expressions project complex emotions. The members of the council were looking for an unequivocal message, that is, a clear illustration of a historical event or an allegory. They expected the gures to communicate a single, unambiguous message. In The Burghers of Calais each gure's expression is complex and multifaceted. About this Rodin says:. I have threaded them one behind the other, because in the indecision of the last inner combat, which ensues, between their devotion to their cause and their fear of dying, each of them is isolated in front of his conscience. They are still questioning themselves to know if they have the strength to accomplish the supreme sacrice. .Miller and Marotta, Rodin:The B.Gerald Cantor Collection, p. Rodin is describing how each of the burghers has an intensely personal experience even though he is part of a larger group. The Burghers of Calais reveals, through gesture and expression, the psychological complexity of each man's decision. > Rodin did not want the sculpture placed on a pedestal. He wanted the gures to be on the same level as those who viewed the sculpture. He stated:Idid not want a pedestal for these gures. I wanted them to be placed on, even afxed to, the paving stones of the square in front of the Htel de Ville in Calais so that it looked as if they were leaving in order to go to the enemy camp. In this way they would have been, as it were, mixed with the daily life of the town: passersby would have elbowed them, and they would have felt through this contact the emotion of the living past in their midst; they would have said to themselves: "Our ancestors are our neighbors and our models, and the day when it will be granted to us to imitate their example, we would show that we have not degenerated from it." But the commissioning body understood nothing of the desires I expressed. They thought I was mad. Statues without a pedestal! Where had that ever been seen before? There must be a pedestal; there was no way of getting around it.Tancock, The Sculpture of Auguste Rodin, p.
Travels in the South of France. Meets Czanne at Monet's house at Giverny. In Calais visits the site of The Burghers of Calais monument. Buys a house at Meudon. Moves to his new house, the Villa des Brilliants at Meudon. The Burghers of Calais is installed in the Place de Richelieu, Calais, on a ve-foot-high pedestal. Exhibits plaster cast of The Monument to Victor Hugo The Metropolitan Museum of Art acquires its rst Rodin sculpture, The Bust of Saint John the Baptist. * The Socit des Gens de Lettres rejects the sculpture of Balzac. Much negative press against Rodin. Ends relationship with Camille Claudel. Exhibits plaster of Balzac and The Kiss (marble) at the Salon de la Socit Nationale, Paris. Opening of the Rodin Pavilion on the Place de l'Alma, near the Exposition Universelle, Paris. Rodin exhibits one hundred and fty works. Exhibits at the Venice Biennale and at the Third Berlin Secession. Travels to Prague for an exhibition of his work. Meets the German poet Rainer Maria Rilke and the American dancer Isadora Duncan. Named Commander of the Legion of Honor. Becomes president of the International Society of Painters, Sculptors, and Engravers following Whistler's death. Exhibitions in Berlin, London, Venice, and New York. Exhibits large plaster and small bronze of The Thinker at the International Society of Painters, Sculptors, and Engravers exhibition, London. Exhibits large bronze of The Thinker at the Salon de la Socit Nationale, Paris. Rilke becomes Rodin's secretary. Exhibits at the Autumn Salon for the rst time. The Thinker is placed in front of the Panthon. Rodin dismisses Rilke as his secretary. Reconciliation with Rilke. Exhibitions in London, Berlin, Paris, Barcelona, Venice, New York, and Budapest. The king of England, Edward VII, visits Rodin at Meudon. Rodin moves to the Htel Biron, rue de Varenne. Exhibitions in Berlin, Florence, Brussels, Buenos Aires, Liverpool, and Vienna. Inauguration of The Monument toVictor Hugo in the gardens of the Palais Royal. The Metropolitan Museum of Art acquires twelve works by Rodin. Travels to London to choose the site for The Burghers of Calais The French state buys the Htel Biron for the Ministre d'Instruction Publique et des Beaux-Arts. The Metropolitan Museum of Art's Rodin collection opens. Camille Claudel conned to an asylum. The Burghers of Calais is placed in the Parliament Gardens in London. Rodin writes a book titled The Cathedrals of France, assisted by Charles Maurice. Germany declares war on France. The National Assembly votes to establish a Muse Rodin in the Htel Biron. Rodin marries Rose Beuret at Meudon on January Rose dies of pneumonia on February Rodin dies on November His funeral is held on November Rodin is buried at Meudon near the grave of Rose Beuret, under the statue of The Thinker. The Muse Rodin is ofcially approved. The Burghers of Calais is relocated to the square in front of the town hall at ground level without the fence that had surrounded it at the previous location. These works of art may be viewed at The Metropolitan Museum of Art. For a more detailed chronology, see Miller and Marotta, Rodin:The B.Gerald Cantor Collection. Copyright 2013 © University Press of Florida and Orange Grove Texts, All Rights Reserved. Powered by SobekCM, the technology of the Digital Library of the Caribbean (dLOC).